I'm finally getting around to posting some of my food photos from my trip to Cuernavaca. I lived with a family there for two weeks while I studied Spanish at a wonderful school called Cetlalic How's my Spanish now? Let's just say it's better but I'm more fluent in the food of Mexico than in the language. The entire experience was amazing. The school has a unique method of teaching grammar in a cultural, political, and social context. The teachers are engaging and super smart. The family I lived with was warm and kind and Dona Mari welcomed me into her kitchen with open arms, let me help her and take photos and answered so many questions. She said she doesn't like to cook, but I don't believe her because it's not possible to make such wonderful food for a perfect stranger unless you like doing it. The home was comfortable and the people in the city of Cuernavaca are inviting and helpful. 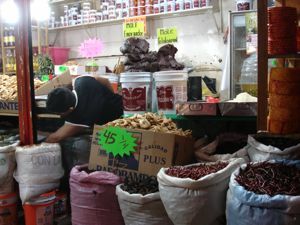 Cuernavaca also has a wonderful market that is large, lively, and full of delicious things to eat. I think I'll go back. I have family and friends in Mexico now. So much better than being a tourist! Here's the first installment of photos and captions. Enjoy! A typical cena (around 3-4pm) after school. 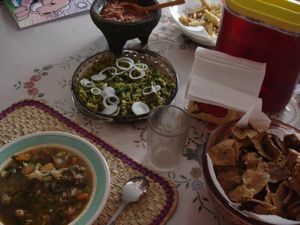 Soup, nopale salad, salsa, agua de jamaica, freshly made tortillas, some kind of meat (not pictured). Freshly made gorditas in the market. 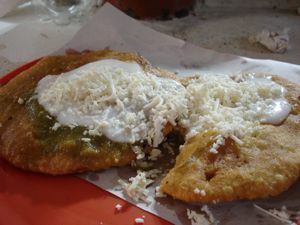 Stuffed with beans, freshly fried and then topped with fiery green salsa, crema and delicious cheese. Craving these now! 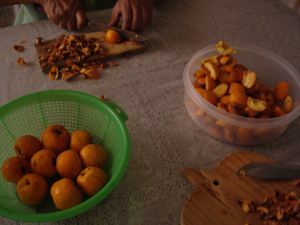 Prepping the fruit for the punche, a fruit cocktail/punch to enjoy with the traditional New Years Eve Posole. 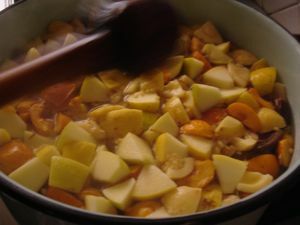 The punche on the stove cooking. 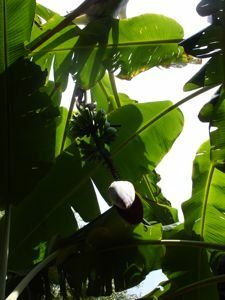 Many fruits as well as fresh sugar cane and tamarind. 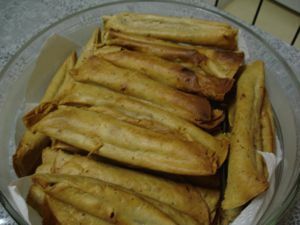 Tacos dorados to serve with the posole. Half are stuffed with potatoes and green chile and the other half with requeson (a type of cheese). Here is the New Years meal. Posole blanco, (traditional accompaniments oregano, lime, chile, avocado) punche, tacos dorados, enjoyed at 11pm before fireworks. 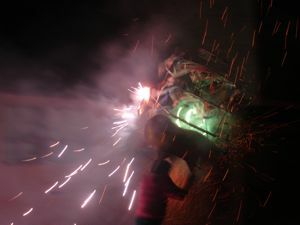 These are the fireworks. It's a structure with a bull in front carried by a runner. 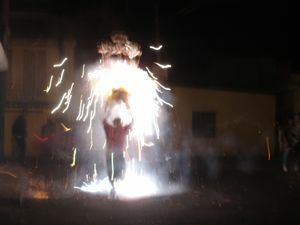 Fireworks fly off in every crazy direction and the people in the streets run with the bulls. It's nuts. 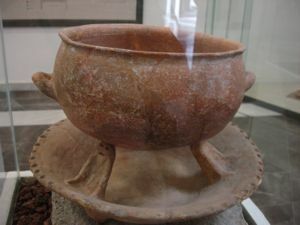 A really cool prehispanic cooking vessel in the excellent museum at the ruins at Xochicalco, an important site outside of Cuernavaca. Gorgeous banana blossom on the tree at the school. That's it for now. 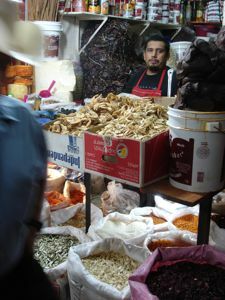 Look for another installment of Markets and Comida in Cuernavaca soon! 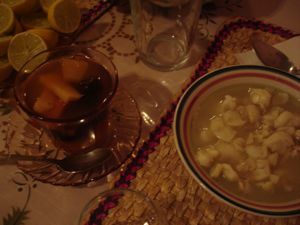 This entry was posted in Food and Drink, Latin American, Travel, from the market, fruit, holidays. Bookmark the permalink. Post a comment or leave a trackback: Trackback URL.